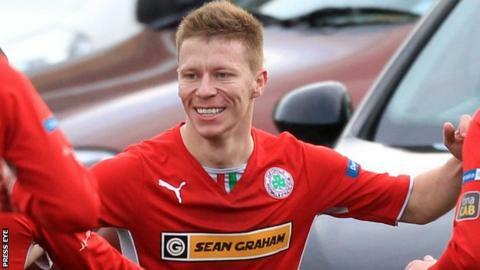 Eamonn Seydak and Stephen Garrett have signed two-year contract extensions with Premiership holders Cliftonville. Both have been with the north Belfast club since the summer of 2010. Defender Seydak, 28, arrived at Solitude from Institute a few weeks after former Linfield forward Garrett had signed from Newry City. Garrett, 26, has scored 33 goals in 177 appearances for the current champions, while Seydak has captained Tommy Breslin's side several times. "Stephen and Eamonn are important players from us and it is great that we have been able to secure them on new deals," said team boss Breslin. "Both are highly thought of at the club - on the terraces as well as in the changing room - and I am sure the news that they will be extending their stays will be well received by everyone at Solitude." Cliftonville are currently locked in a tense battle for the Premiership title with Linfield. With four games left in the campaign, the holders are one point ahead of the Blues, and they are at home to Glentoran this Saturday while Linfield are away to third-placed Crusaders. Linfield have won the championship on a record 51 occasions while four-times winners Cliftonville are aiming to retain the Gibson Cup for the first time.